This is another yet flagship of MyPhone, the MyPhone A888 Duo is packed with 1GHz dual-core MT6577 processor, so that multitasking and fast app switching is not a problem at, plus the good feedback of MyPhone A888 Duo from various users, they even go as much as comparing Myphone to Cherry Mobile, but we are not here to talk about that. MyPhone A888 Duo is equipped with 8MP autofocus camera with dual LED flash and it supports 720p video recording, and a 1.3MP front-facing camera. Another note for MyPhone A888 Duo is the huge 4.5inch display, all this cool specs for just Php7,499 SRP. But wait! There is a Myphone promo going on around this June, Myphone called it "Myphone Android Invasion", more info below. 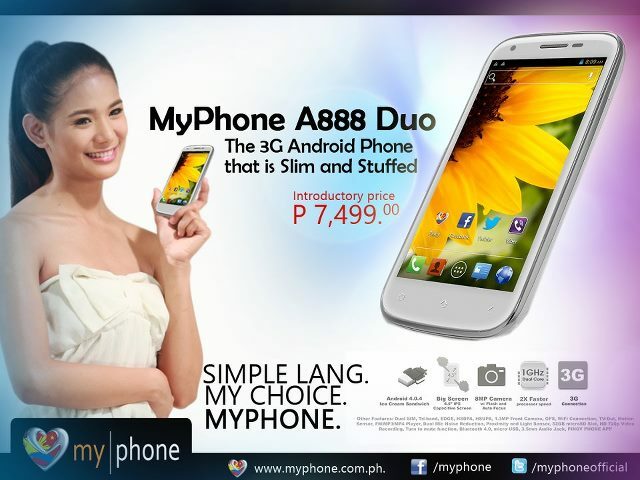 MyPhone A888 Duo's original price at Php7,499 | Available in the Philippines nationwide. Due to Myphone android invasion, MyPhone A888 Duo can now be bought for only P5,490, android invasion is available nationwide, promo runs until July 15, 2013. Update: Promo has extended as of August 2013! P5,490 pa rin po ba ung brand new a888 ngayon? thanks. Extended po yung promo nila. Pnu pg lumampas ng august back to real price nb? until august 31 lang talaga ung promo nila? It depends sir, kasi noon hanggang July 15 lang daw, ayun extended din pala. About smartphones, they say it's very common to see part of their internal memory as 'missing' hahaha. Or gone, like, you've been cheated. Like "Hey this phone has 4gb!" And then you bought it and you see it only has 1gb. But the truth is that your phone is actually using the 'missing' gb. Natural lang po sa phone mo na 1gb yung matitira, while some memory are allocated to the OS, system cache, app cache, browser cache, at iba pa. I would recommend you to buy extra memory (microSD). P.S - sa Jelly Bean kasi everytime you install an app, dun yun naka save sa internal memory. until now kaya may promo pdin? am planning kc to buy tomorow.. sana sale pa, pra yung A919 na yung mbili ko. ask ko lang po how to root A888? ilang beses ko na kasi ginawa ung instructions, unsuccessful sya lagi pagchineck n s root checker.